One of my favorites–I like to sprinkle it on (Adeni Classic Fish Sauce and rice with lentils, see Sanunat Samak . 5) 4 tblsp of Canola oil for frying–more if dries out. You do want to fry the eggplant pieces, but not deep fry. Combine eggplant slices, cumin and salt–toss well. 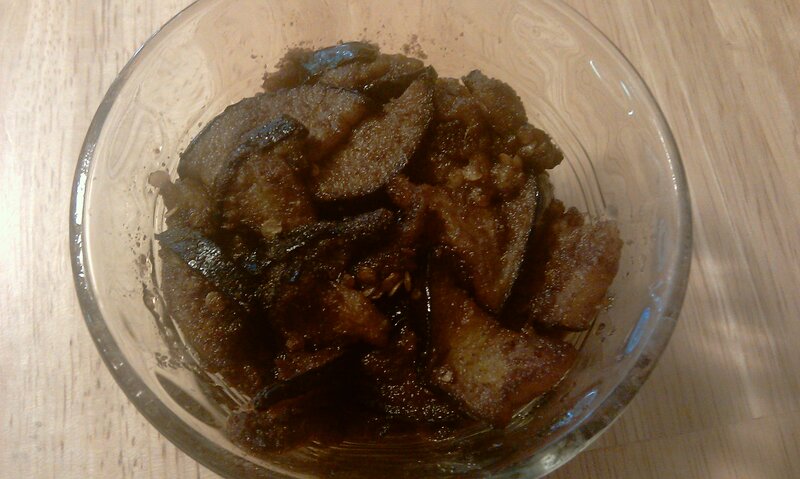 In a frying pan add the oil, once it gets warm add the eggplant, salt and cumin mixture. Fry until cooked through and browned. Then add the vinegar, and turn off and serve when it dries out. It is absolutely delicious. It is one of those things that you want to eat a lot of, but hey its a condiment not an entree!